At the heart of this calming roadside sanctuary, a seemingly ancient cotton tree stands tall among the rest of the greenery that spreads out across the outdoor area of Casa del Pio. The cotton tree came with the property and has roots that go so far as the neighboring property. It’s become a monument for what Casa del Pio stands for—being grounded in what really matters, especially family. Its proprietress, Ginny, is a modern woman who takes pride in her old-world roots. She uses an almost-vintage Nokia phone (“Hindi ako gumagamit ng data,” she shares), encourages her kids to do arts and crafts activities outdoors, and refuses to install wifi in Casa del Pio. “You come here to enjoy the place and be disconnected,” she explains cheerfully. 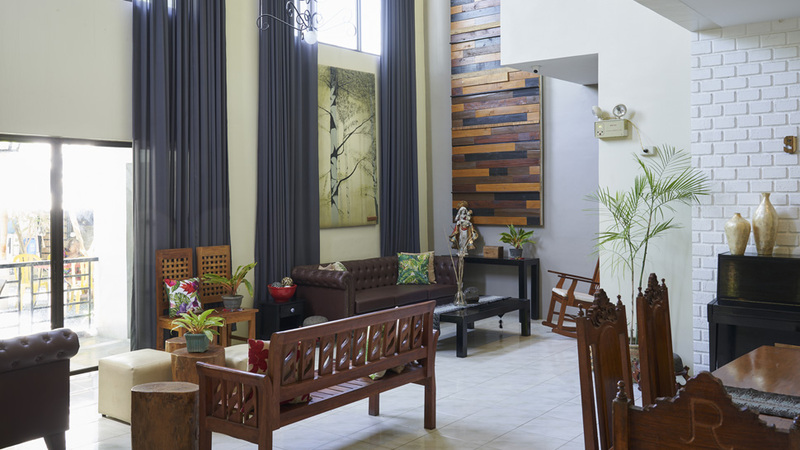 Located just a few minutes away from the Southwoods Exit in Biñan, Laguna, the resort/hotel caters to sizeable gatherings whether among family or friends. Inspired by her own large family’s enthusiasm for getting together for weekends away from Manila, Ginny wanted to create a space that encouraged pleasure in the simple things, such as cooking for a crowd, dancing under string lights and a canopy of leaves, lounging in the pool, and the undeniable Filipino favorite: belting it out on the karaoke. 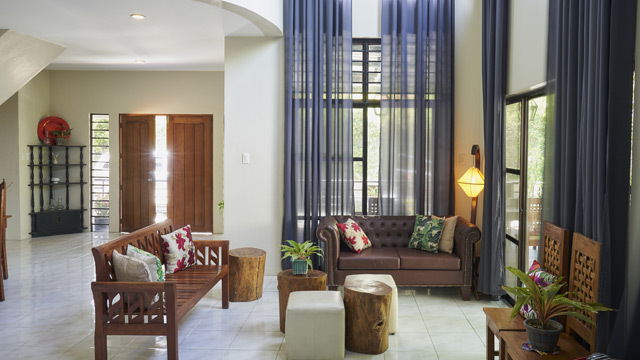 Along with design consultant Grace Moslares of Magara Designs, Ginny sought to revamp the property into a place that would evoke a “provincial Filipino vibe” that anyone can comfortably unwind in. Tall windows set beneath a double height ceiling add drama in the living space while ensuring that ample natural light filters into the room. 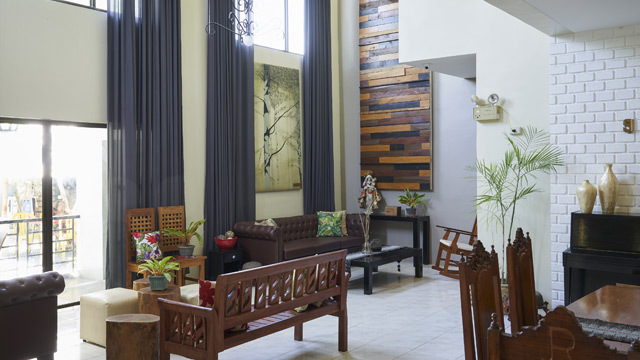 A wooden accent piece showcases the high ceiling, while sprucing up the blank wall. It also complements the pieces in the space while helping create a warm, homey vibe. 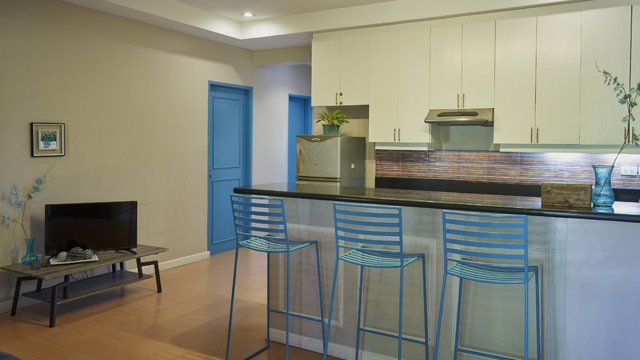 The dining area is reminiscent of a typical dining setup seen in many Filipino homes with a wooden dining set and stately chairs. 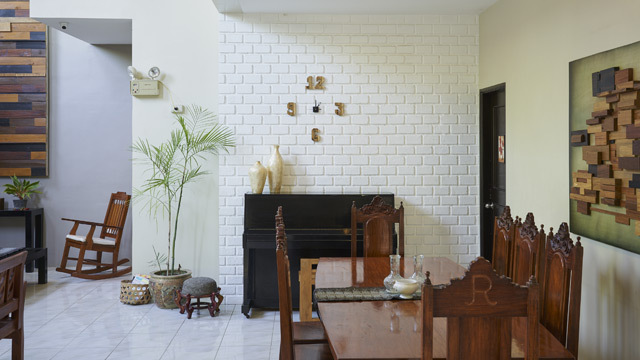 To define the space, a white brick wall serves as a focal point. Adding to the laidback feel of the space are the plants and other unique decor pieces like the wall clock. There are two separate apartment-type rooms in the main house. Each has its own toilet & bath, three bedrooms, a kitchen, and a small living area. As the name suggests, the Blue Suite is defined by touches of blue—from the barstools to the color of the doors. It's a bright and airy space, with enough room for cooking, lounging around, and family bonding. To go with the blue theme, the rooms are completed with sheer white curtains, crisp sheets, and pops of blue. The combination is refreshing, as if inviting you to take a well-deserved slumber. 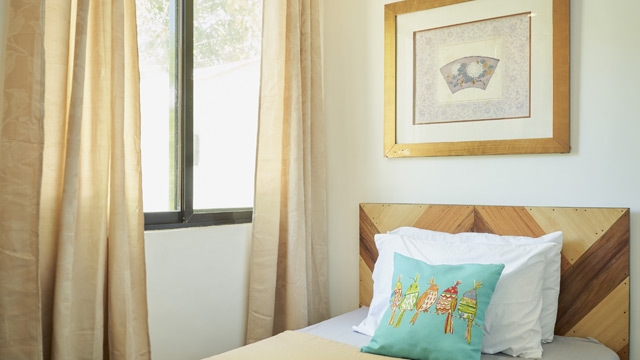 Using printed pillow covers add pizzazz to the room while still maintaining the calming look. Hints of pink—from knobs and pulls, to lighting pieces and furniture—complete Casa del Pio's Pink Suite. Similar to what's seen in the Blue Suite, a roomy kitchen, a living area, and bedrooms complete the suite. 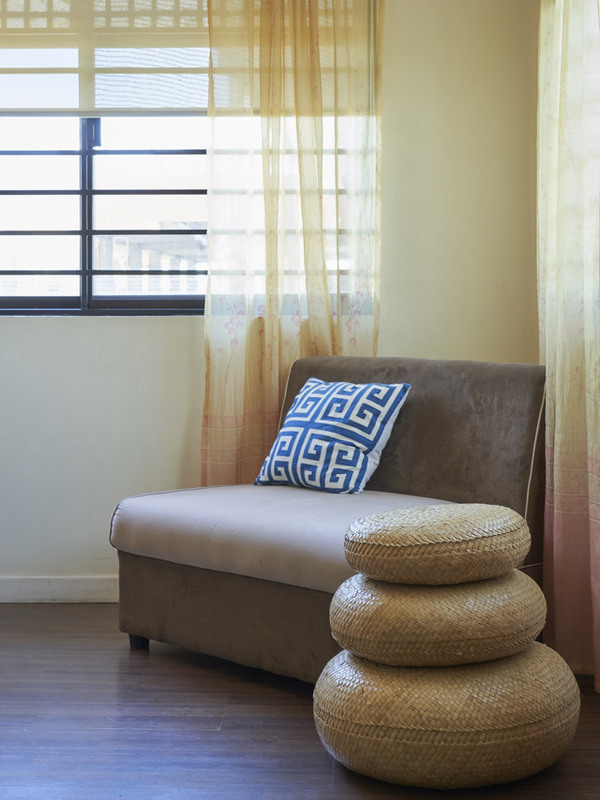 Those who wish to catch up on their reading can stay in this quiet nook bathed in natural light and completed with a plush seating piece and fluffy pillows. 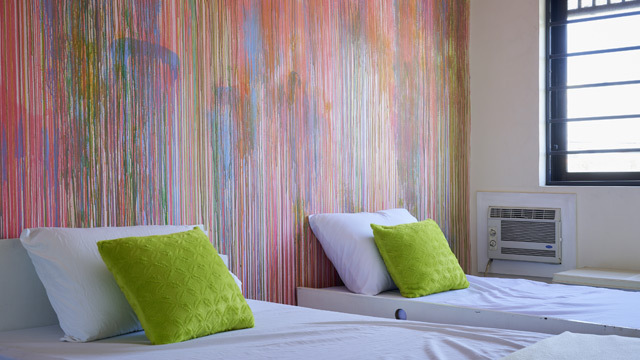 Instead of leaving the walls bare, Grace and Ginny decided to spruce it up a psychedelic mix of colors. 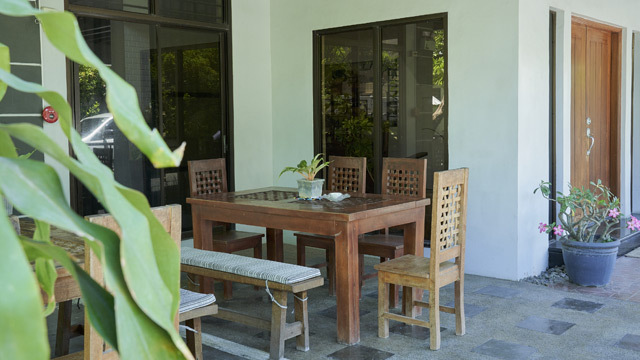 To maximize the space, even the outdoor areas are furnished with tables and seating pieces to allow the guests to relish the fresh air, sunlight, and the feeling of being outside. 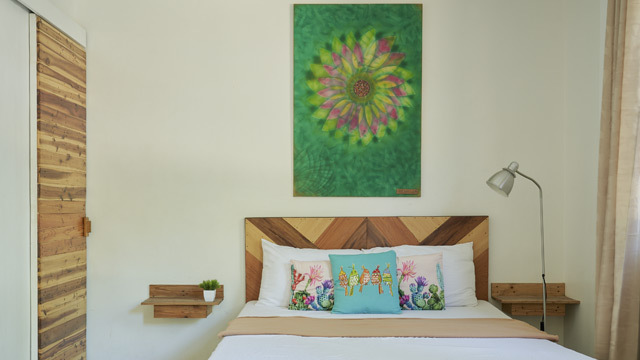 We love the wooden headboards that define the beds and the wall-mounted shelves that can hold gadgets, books, and other belongings. 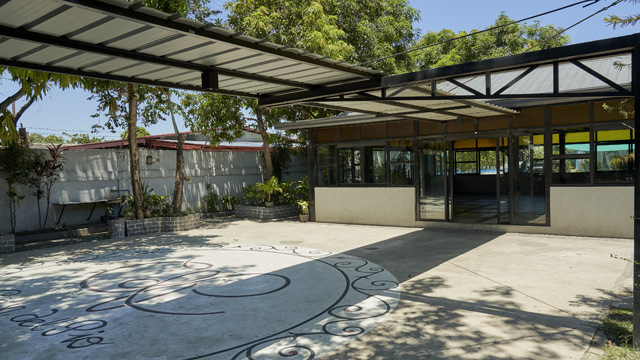 Five cabanas are situated between the main house and the pavilion, under the shade of the big cotton tree. Right outside the cabanas is an open area dotted with a couple of rocking chairs that make for good spots to relax, read a book, or take a nap. For larger gatherings, the pavilion can serve as a dining hall, a dance hall, or both. 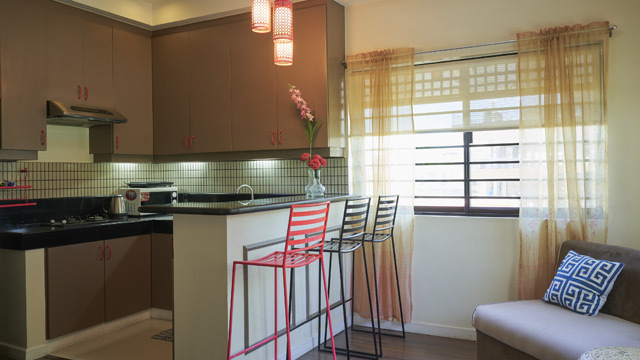 Its transoms are accented by the use of yellow mansanas glass that gives its exterior a bahay kubo vibe. Casa del Pio is located along Silangan Road, Barangay San Francisco (Halang), Biñan City, Laguna. For more details, you can get in touch with them through mobile at (0942) 646-8756 or follow Casa del Pio on Facebook.